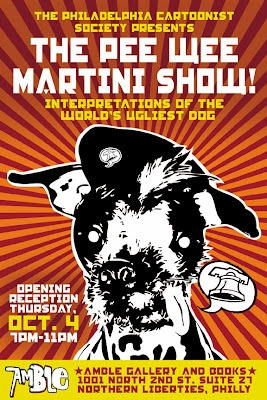 The Amble Blog: The Pee Wee Martini Show! Looky looky it is our GRAND OPENING exhibition with very special guests The Philadelphia Cartoonist Society and the World's Ugliest Dog!! It is going to be the supreme event folks. I wouldn't miss it! I can't wait for this, Chedda!